Patrick Gregory Fitzgerald, known as Pat, was born on 14 February 1895 at Timaru and baptized Catholic just three days later, on 17 February 1895, at Timaru. He was the sixth son of William (Bill) and Mary Ann (née Madden) Fitzgerald, and one of the four sons who served abroad in World War I, with a fifth son also enlisting. This was a typically large family, the oldest children being born at Ashburton, before the family moved to Timaru. The last born, Lawrence, died in 1908 at 3 weeks. Pat’s early education was at the Sacred Heart School, Timaru, and from there he moved to the Marist Brothers’ School. At the December 1910 prize-giving of the Marist Brothers’ School, he received the Sixth Class Aggregate Prize, as well as the Special Prize for Best All-round Athlete. No doubt he was seated at one of the “tables well stocked with good things dear to the healthy school boy”. He followed up with a Certificate of Proficiency. Like his brothers he was very much into sports, being a member of both the Celtic Football Club and the Celtic Cricket Club. He also won medals for swimming. He was about 13 years old when he started to make his mark in swimming when, participating in the Timaru Amateur Swimming Club’s carnival in February, he came second in one heat of the 50 Yards Schoolboys’ Race. In March 1909, representing the Marist Boys School, he finished in second place, by only a few inches, in the 100 Yards event; and he helped Marist to win the Education Board’s Shield. Further success came in February 1911, when he held on to win the third heat of the 100 Yards Inter-Club Handicap, a very competitive event; unfortunately he couldn’t make a podium finish in the final. A high point came in February 1911, when Pat played a significant part in Marist’s shield win in the Schoolboys South Canterbury Championships – first in the 100 Yards, and third in both the Diving and the Back-stroke, 25 yards. It was reported in February 1912 that “P. Fitzgerald is now swimming well, and training hard for some of the forthcoming long distance events.” He also won the first semi-final and finished second in the final of the 50 Yards Inter-Club Handicap. The following month he came in third in the 200 yards final after winning his heat. In May 1908 Pat turned out for the Marist School in a football match against Waimataitai School and was one of the try scorers, with Marist running out the winners 11-3. This was just the start of his rugby playing. From 1910 he was selected regularly in the Celtic teams, starting in the Fourth Grade and playing in matches against Zingari, High School II and others. In June 1911 he was selected in the Celtic Thirds for the seven-a-side tournament, and continued to play in the Third Grade throughout 1912. It was in May 1913 that Pat was selected to play for the Celtic Juniors; and in August he was named as an emergency for the Celtic Seniors. He turned out for the Seniors in 1914, a season in which Celtic struggled a bit early in the season, although Pat managed a try in a closely fought match against Pirates and played particularly well on the wing in the match against Pirates. Four brothers playing together in this senior team – William, Thomas (Ben), John and Patrick - would become a poignant memory for the three older boys. Eighteen-year old Pat was again in the team in a grand spectacle against Zinagari in June. “P. Fitzgerald, who was custodian in the second half, did very well. He was safe and made very few mistakes of any consequence.” Further selections in the Celtic senior team - and for Pat his last - followed in 1914. The summer of 1908 saw Pat in whites. Although he was dismissed for a duck in the match against Main School, Marist did win, and maybe Pat brought about some of the Main School dismissals. The 1910-1911 season saw him playing for Celtic against Timaru Club, this time finishing ‘not out’ on 9. On leaving school, Patrick worked in the solicitors’ office of Messrs Raymond, Raymond and Campbell, Solicitors. A preference for outdoor work, however, led to his taking up woodwork with Mr R. Hunt, and afterwards with Messrs Hall Brothers. He was serving an indentured apprenticeship in carpentry when he enlisted. P. G. Fitzgerald enlisted on 8 January 1915, only 19 years 11 months old, at which time he had previously served with the 2nd South Canterbury Regiment, “just returned to the Dominion”. Where had he been? He had indeed served with the Second South Canterbury Regiment. From 17 to 20 March 1913 the Infantry was to go into camp at Yaldhurst. Private P. G. Fitzgerald was named in the advance party which was to proceed per the first express on March 15 to Hornby. In March 1914 he was given an opportunity to make up his tally of parades after failing to attend Territorials’ parades. Some ten weeks later he and his brother John came before the Court on a Defence case – unsatisfactory attendance. Both were convicted and discharged. On enlistment, Patrick was single and living at home, at 3 Wellington Street, Timaru (2 Wellington Street after renumbering at a later date). Like his brothers, he was a well-built young man – 5 feet 11 inches tall, weighing 162 pounds and with a chest expansion of 35-37½ inches. In other respects he was in good health, although his upper teeth were bad and the lower only fair. Physical strength and fitness, however, counted for little on the battlefield. He nominated his father, William Fitzgerald, of 3 Wellington Street, Timaru, as his next-of-kin. All too soon this was to change. William Fitzgerald, senior, died on 21 April 1915 as a result of an accident. An experienced builder’s labourer, he was engaged in the demolition of the Grosvenor hotel when the brickwork on which he was standing gave way and he fell headlong on to the pavement below. He was much honoured by kindred associations at his funeral. William Fitzgerald was 56 years old and left a family ranging in age from 31 to 8 years, and only days before he had seen a fourth of his sons (William) leave for service at the Front. Mrs Fitzgerald inserted a letter of thanks to the insurance company for prompt settlement of her claim, in the Timaru Herald of 30 April 1915. This strong woman - Mrs Mary A. Fitzgerald, 3 Wellington Street, Timaru - then became the next-of-kin for her son Patrick. Patrick Fitzgerald embarked at Wellington on 17 April 1915, headed for Suez, Egypt, with the Canterbury Infantry Battalion of the Fourth Reinforcements. From Egypt the Canterbury Regiment arrived at ANZAC Cove on 3 June, and was subsequently involved in the August offensive to attack and capture the Heights of Chunuk Bair. At some point during the capture of Bauchop’s Hill, Rhododendron Spur and the APEX, Private Patrick Gregory Fitzgerald lost his life - killed in action on 7 August 1915 at Suvla Bay, Dardanelles, less than four months after embarkation, aged just 20 years. A notice to this effect appeared in the 9th September issue of the New Zealand Tablet. His name is recorded on the Chunuk Bair (New Zealand) Memorial, Chunuk Bair Cemetery, Gallipoli, Turkey - one of 851 New Zealanders, who died between 6th and 11th August 1915. He was a bright young man with a promising career, and “played the game to the end”. The Celtic Football Club was formed in 1906, “to keep boys together after they left the School”. Membership was restricted to youths under 20. This provided an ideal opportunity for the young Fitzgerald lads. W. Fitzgerald was a member of the first team entered in the President’s Trophy (third grade), and brother Garrett played in the South Canterbury representative team which toured the North Island in 1908 and on other occasions. “It may be permissible to mention the Fitzgeralds, whose representative record is unequalled in Timaru. Garrett, the eldest, . . . . In turn came Joe, Bill, Tom (Ben), Jack and Pat.” (The “Marist Brothers School Jubilee 1892-1952” publication). Patrick and his brothers, Thomas and John, had all enlisted and embarked together with the Fourth Reinforcements. Thus Tom, John and Pat were all ‘side-by-side’ at Gallipoli. 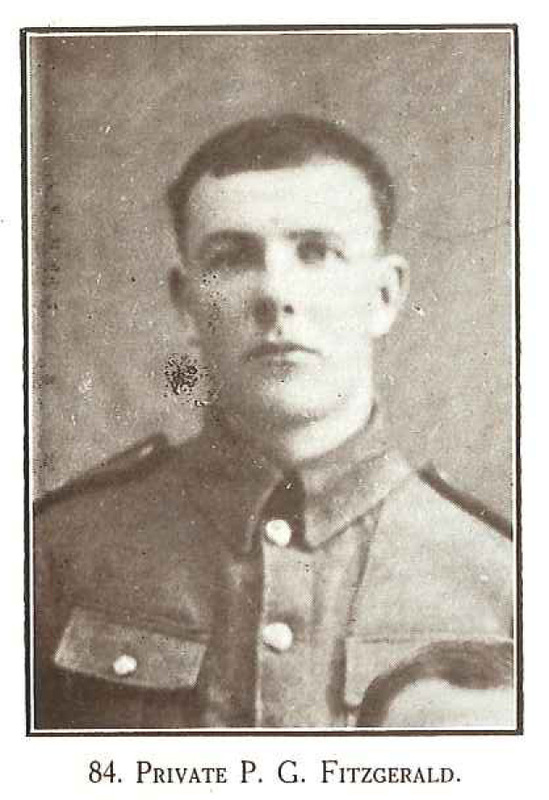 Thomas, known as Ben, was wounded on 7 August 1915 in the same conflict as ended Pat’s life, and returned home soon afterwards as a consequence. In 2013 Anne O’Connell, John Fitzgerald’s daughter, recounted that her father, John, had the horrific experience of seeing his brother Patrick killed at Gallipoli; he had to step over his body and was unable to stop and pay his respects or take him for burial. This experience haunted him for the rest of his life. This is the only thing that John told his family of his war time. He was not a well man ever after the war. Their brother William, who had just enlisted and gone to Trentham when his father died, was allowed to return home for family reasons. When he was called up in 1916, he appealed on the grounds of undue hardship, explaining that he helped support his mother. The appeal being dismissed, Bill left for the Front in 1917. Yet another brother, Michael Joseph Fitzgerald (Joe) (82054) was drawn in the ballot and left as part of South Canterbury’s quota of the 43rd Reinforcements, but went no further. In early 1918 the oldest brother, Garrett Fitzgerald, appealed his call up, explaining the he supported his mother and the rest of the family, as well as his wife and own family. His appeal was adjourned sine die. Pat’s nephew and namesake, Patrick Gregory Fitzgerald, served in World War II, as did another nephew, Bernard John Fitzgerald. Yet another nephew, Flying Officer Michael Joseph Berry, died in an aircraft accident in the Battle of Britain. Mrs Mary A. Fitzgerald, 3 Wellington Street, Timaru, was the recipient of Patrick’s medals - 1914-15 Star, British War Medal, and Victory Medal, and the scroll and plaque. They (Bill, Tom, Jack, Pat) came from an extremely poor family, recalled Anne O’Connell, the granddaughter of Mrs Mary Ann Fitzgerald. Patrick Gregory Fitzgerald is remembered on the Timaru Memorial Wall and the Sacred Heart Basilica, Timaru, Roll of Honour, and on his parents’ headstone in the Timaru Cemetery – For the Justice of God, His King and Country. An In Memoriam notice of 7 August 1916, inserted by the loving members of his family, read – “One lonely year has passed and gone, since our great sorrow fell, Yet in our hearts we mourn for the one we loved so well.” While Patrick Fitzgerald died intestate, the public Trustee elected in January 1917 to administer his estate, the sum total of which was deferred military pay (£5.18.8).. His photo appears in “South Canterbury Caledonian Roll of Honour” published by the South Canterbury Caledonian Society, 1916, and held by South Canterbury Museum, and in “Onward: Portraits of the New Zealand Expeditionary Force, Volume 1”compiled by P J Beattie and M J Pomeroy.